A relative has identified one of the six people killed in a fire that destroyed nearly 1,000 Northern California homes. Sixty-two-year-old Daniel Bush died last week as fire swept through the Redding area. His sister, Kathi Gaston, tells the Redding Record Searchlight that her brother had returned to his mobile home in the community of Keswick last Tuesday after undergoing quadruple heart bypass surgery. [post_ads]The Carr Fire came through the neighborhood on Thursday. Gaston said her brother wasn’t allowed to drive and couldn’t evacuate without help but she couldn’t reach him because the roads to his home were blocked by sheriff’s deputies. The fire also killed two firefighters, a 70-year-old woman and her two young great-grandchildren. Fire officials say the blaze has destroyed 965 homes, 16 commercial buildings and 397 outbuildings. A third wildfire has erupted in Northern California and prompted evacuations even as hard-pressed firefighters struggle to contain blazes that have burned nearly a dozen homes. Fire and sheriff’s officials say a blaze dubbed the Eel Fire erupted Tuesday afternoon near the rural community of Covelo in Mendocino County and quickly grew to 1 square mile. There aren’t any immediate reports of houses burned but official have ordered evacuations for about 60 homes in the area, an old ranching and farming area on the edge of a national forest. The fire is about 40 miles north of where twin wildfires have burned seven homes since last Sunday and threaten some 12,000 residences. National Park officials are extending the closure of the scenic Yosemite Valley and other areas due to heavy smoke from a massive nearby wildfire. The Yosemite Valley, the Mariposa Grove of giant sequoias and other park areas closed July 25 and tentatively scheduled to reopen on Friday. The closure was also put in place to allow crews to perform protective measures such as burning away brush on roadways. The closures have been a huge blow to the park during the peak summer season and to thousands of tourists, who book months in advance at the parks campsites and hotels. Gediman said it was the longest closure at Yosemite since 1997 when floods closed the park for over two months. Northern California authorities say there are seeking help from the public locating six people listed as missing from the Carr Fire in Shasta County. Redding Police Sgt. Todd Cogle said they have located 14 of 20 people listed as missing from a Tuesday afternoon press release. He said at least two of the six people have homes that are still standing and at least one is a transient with no address. The massive blaze, which is about 200 miles north of San Francisco, has destroyed nearly 900 homes and killed two firefighters and four civilians. Two summer camps near Yosemite National Park popular with San Francisco area families have decided to evacuate due to smoky weather conditions from a massive wildfire. The San Francisco Recreation and Parks Department said Tuesday it has temporarily closed Camp Mather, a campground for families near the park, due to poor air quality from nearby fires. The camp is scheduled to reopen Sunday if conditions improve. Parks spokeswoman Sarah Madland said about 450 visitors to Camp Mather and 70 staff were affected, including 350 visitors asked to leave Tuesday and 100 who had canceled last week due to the air quality. All are to receive full refunds. Camp Tawonga, a sleep-away camp for children west of Yosemite, decided to evacuate 300 campers and 200 staff Tuesday and also hopes to resume camp on Sunday. The Environmental Protection Agency says smoky wildfires in the U.S. Southwest affected national air quality figures in 2017. The EPA released yearly air-quality counts Tuesday showing upticks in soot and some other pollutants nationally. EPA air official Bill Wehrum says officials believe the main cause was wildfires. California was one of the states experiencing record wildfires in 2017. Wehrum says the smoke was enough to “move the needle” on national air-quality figures. California fire officials say they are making progress as they battle several blazes burning in Northern California and that firefighters are focused on saving lives and homes. Battalion Chief John Messina said Tuesday fire crews slowed the spread of one of the blazes into towns near Clear Lake, including Lakeport, a city of 5,000. He says the fire instead spread into the Mendocino National Forest. Messina says fire crews focused their efforts on saving lives and homes and that’s why only 10 houses have been destroyed by two massive fires straddling Mendocino and Lake counties. No injuries have been reported. But he told a community meeting in Lake County that people should remain vigilant because fires can easily jump containment lines. The impoverished county about 110 miles (180 kilometers) northwest of Sacramento has been hit by several wildfires since 2015, when a wildfire destroyed thousands of homes and killed at least four people. This version corrects that the blaze is near Clear Lake and the city of Lakeport and that Clear Lake is a lake, not a city. California officials say fire crews have made some gains against twin wildfires that are threatening several lakeside towns. The state’s Department of Forestry and Fire Protection said Tuesday that firefighters increased containment from 5 to 10 percent of the two fires straddling Mendocino and Lake counties in Northern California. The wildfires have destroyed seven homes and have burned 116 square miles (300 square kilometers) of rural land. Officials on Monday ordered residents of two towns near Clear Lake to evacuate. The notice was for the towns of Kelseyville and Finley and brought the number of people affected by those fires to about 18,000. A massive blaze that killed two firefighters and four civilians has now destroyed 884 homes. That’s up from 823 homes previously reported destroyed. California fire officials said Tuesday the wildfire burning near Redding, California for more than a week has scorched 172 square miles (445 square kilometers). But fire crew have gained some ground and increased containment to almost 30 percent. It is believed to be the ninth most destructive fire in state history. [post_ads]More than 50,000 people remained under mandatory evacuation orders Tuesday in Northern California, where a deadly blaze has destroyed more than 800 homes. Another two wildfires burning about 14 miles (22 kilometers) apart are threatening 10,000 homes. 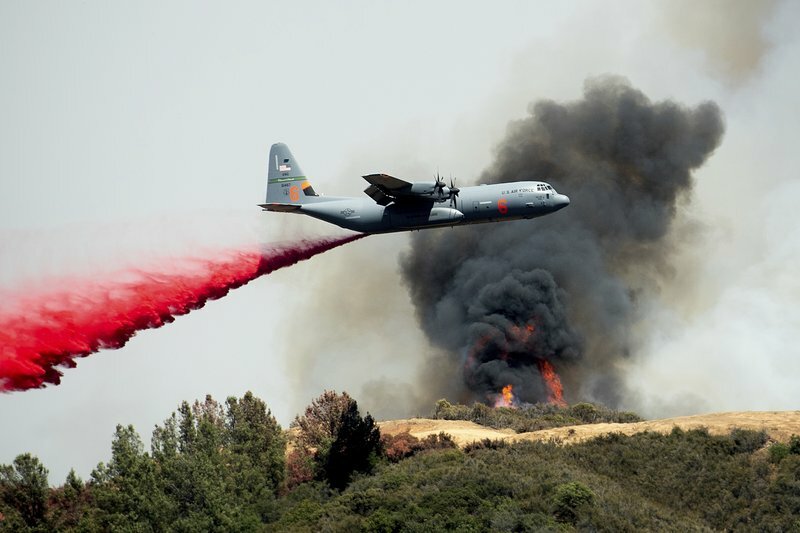 Twin wildfires in Northern California are threatening some 10,000 homes and posing yet another struggle for firefighters already stretched thin by a summer of horrific and deadly blazes. The fires straddling Mendocino and Lake counties have burned seven homes and forced the evacuation of Lakeport and small surrounding communities. About 100 miles north, a fire that has killed six people continues to threaten the Redding area. The so-called Carr Fire has destroyed 818 homes and 311 outbuildings. State fire spokesman Scott McLean says it’s the ninth most destructive wildfire in state history. Some 12,000 firefighters are battling the blaze. Fire officials say they’re making progress against the fire, which is 23 percent contained. More than 27,000 people remain evacuated.